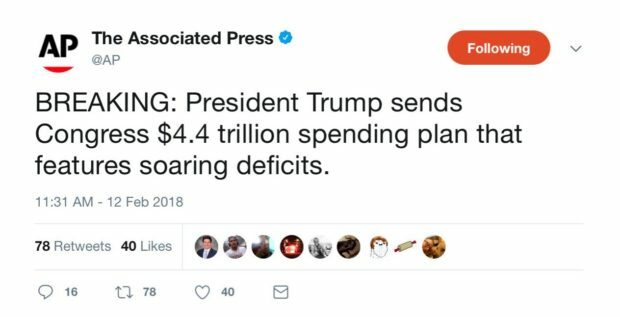 The Associated Press’ Twitter account trashed President Trump’s spending plan for featuring “soaring deficits” but didn’t offer the same critique of Obama’s plans in 2015 and 2016. Fox News contributor Stephen Miller first pointed out the discrepancy between the AP’s commentary on Trump’s and Obama’s spending plans. However, in their tweets about Obama’s deficit-ridden spending plans in 2015 and 2016, AP instead chose to comment on specific areas of spending from the plans. PBS reported in 2015 that Obama’s spending plan would push the deficit from $485 billion to $583 billion and would never reach balance over the following decade. The 2016 spending plan projected a $503 billion deficit.